Music producer Andy Lutschounig created his "Adoro" classical-pop crossover project in 2007, when he chose five young opera singers from among 200 applicants. Adoro's music combines elements of opera with German pop songs and a large symphony orchestra, as could be appreciated at their recent performance at the Lausitzhalle in Hoyerswerda. Atlantis Audio provided the concert lighting equipment, which consisted of 22 Clay Paky Sharpys, 24 Clay Paky Alpha Spot QWO 800 STs and other lights. 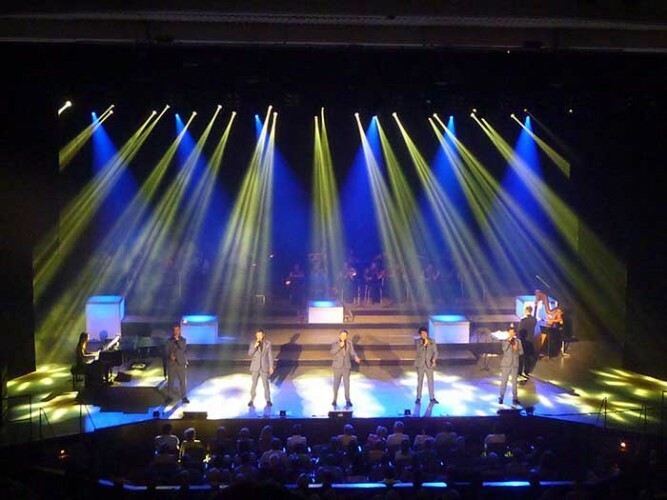 Volkmar Kusch, the owner of Atlantis Audio, had this to say about Clay Paky Alpha Spot QWO 800 STs and Sharpys: "Alpha Spot QWO 800 STs are currently used on many occasions, as our case shows. We were particularly won over by the perfect image quality, compact size and wide zoom range. All this makes them suitable for many uses and, for this reason, we wanted them in our range of lights at all costs. Clay Paky Sharpys are unique! No other light measures up to them. We have therefore extended our range of equipment with this moving light too." Show production was entrusted to POOLgroup GmbH in Emsdetten.